The previous meeting minutes from December were read by Club V.P Shawn G. and was passed by all members present. Shawn also presided over this meeting, as Club Prez. Jim K. was away in California at this time. 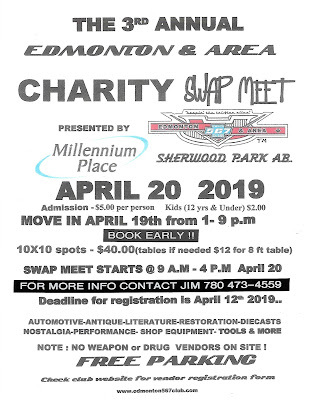 The idea of having the Swap Meet at a Southside warehouse fell thru But Jim has secured the Sherwood Park Location for the club.. To be held on April 20th.. We have close to 80 10 x 10 stalls available & the fee is still only $40.00 for a stall. Tables if needed will be $12.00 extra but only currently have a few to use from the local church. This is the first time since we went this route that the province has been very slow in giving this status to us. Normally it has been accepted and completed by Christmas but not at this time (province is “dragging” their feet on this). Still pending. WHY ? Still No policy, Jim has contacted them on this matter & as of to-day still no answer from them. Still pending?! 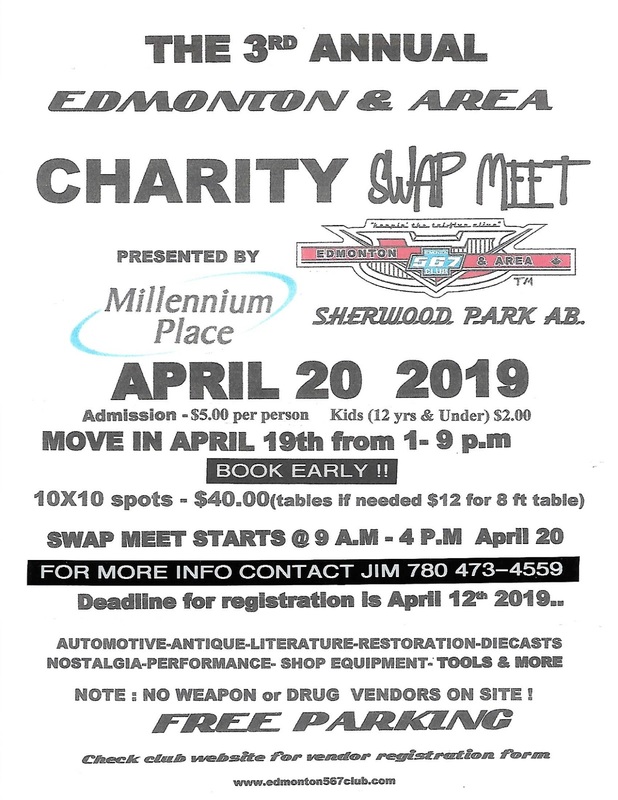 The Saskatoon 567 club as was presented earlier is hosting this 3 day event. As far as we know about it, Accommodation is filling fast so book early.. Limited space! Their club rep. Gary Cherneski was fairly vague on the event when asked in December at Norm’s place. It is slated for July 11-15th/2019.. Hopefully more info will be brought to our attention on this event. This is slated for August 24 2019, start seeking door prizes for this event & promoting the event!!! Cash was won by ?and the Poster was won by ? Meeting ended at 7:50 P.M. Located at 111 Ave and 151 St.